View from SSE showing S engine house and store building in foreground. View from SW (main gun platform) looking to No.2 gun emplacement with the Battery Observation Tower. 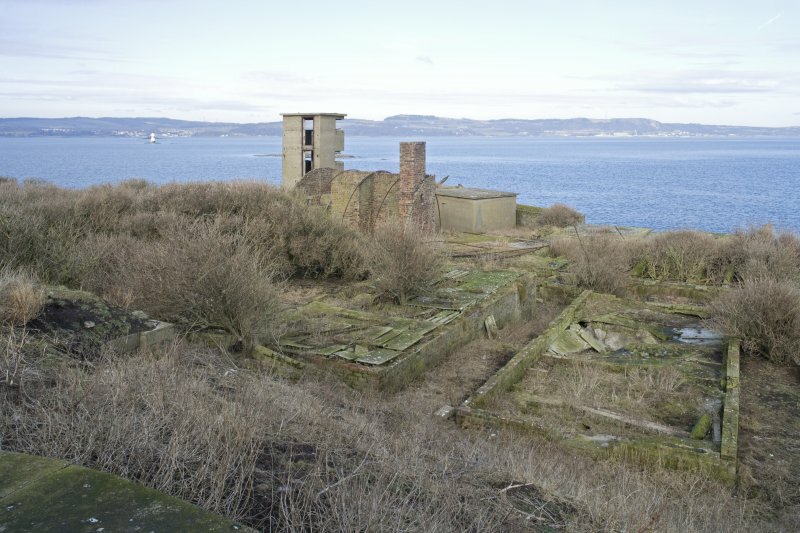 View from NW of W side of island showing No.1 gun Battery Observation Post and main Baattery Observation Post. Distant general view from the E of the island. 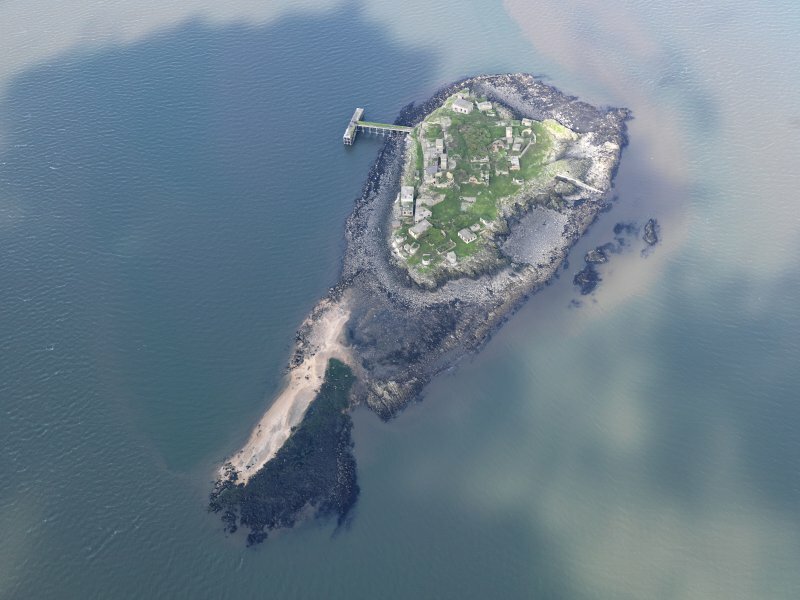 General oblique aerial view centred on the Island, taken from the ENE. 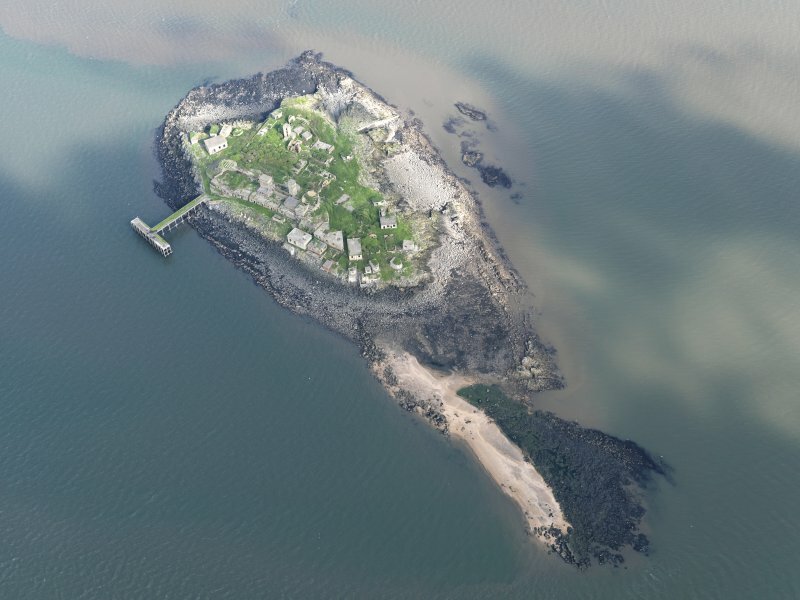 General oblique aerial view centred on the Island of Inchmickery in the Firth of Forth, taken from the NE. 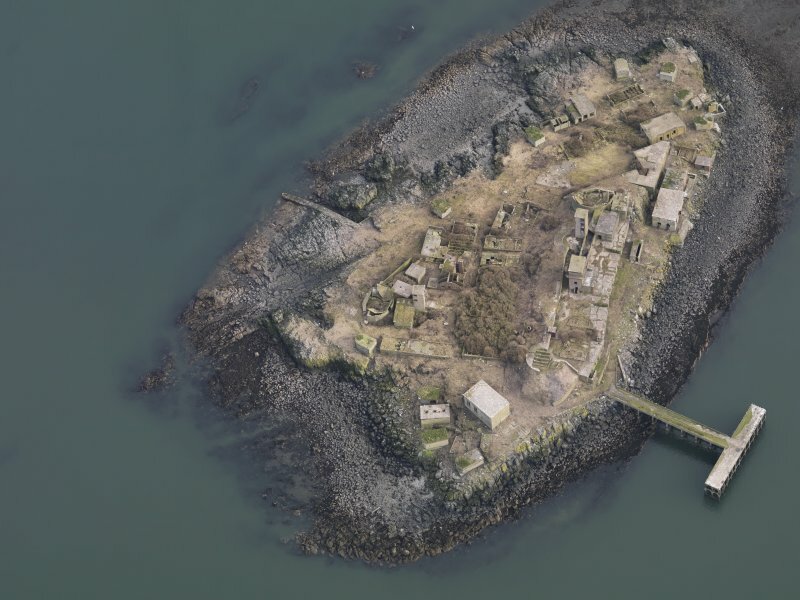 Oblique aerial view of Inchmickery centred on the 20th century military remains, taken from the SW.
Oblique aerial view of Inchmickery, taken from the W.
General view from E of island. View from SSW showing brick built blockhouse/pillbox at N end of pier. 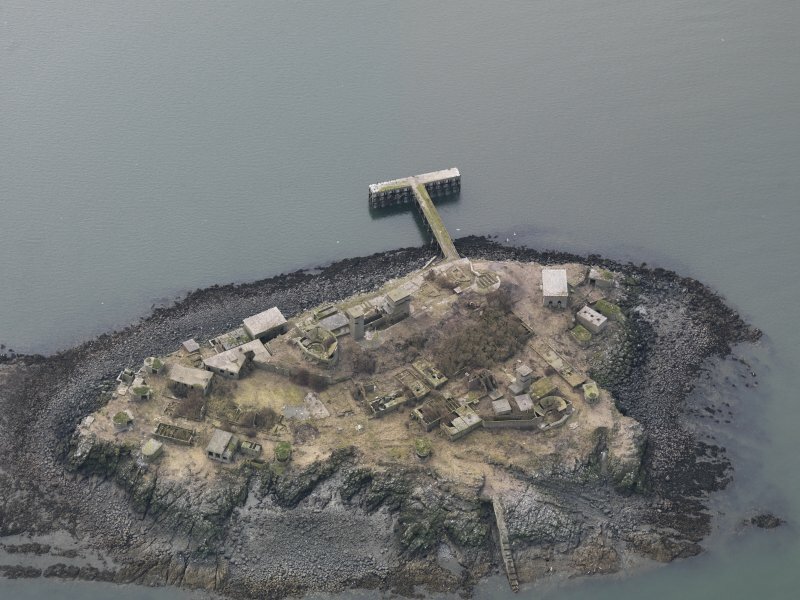 View from NW (N end of the pier) on Inchmickery showing Battery Observation Posts and First World War buildings on W side of island. 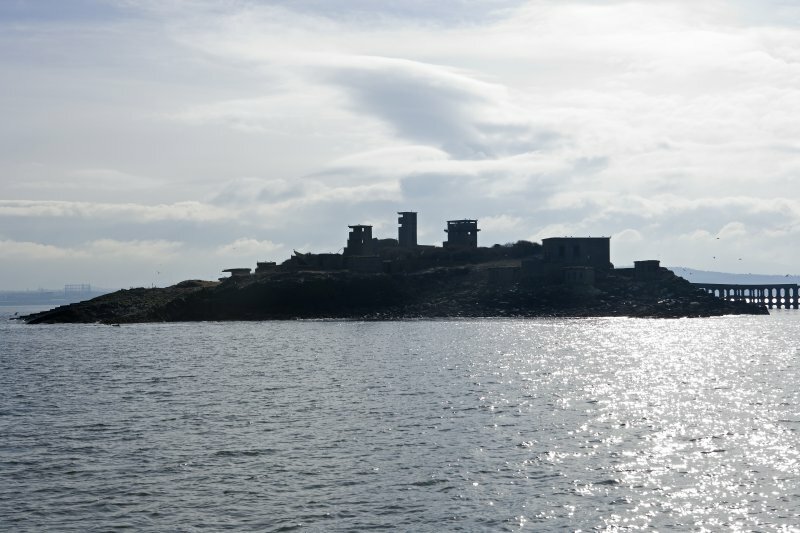 General view from NW of island from approaching boat. 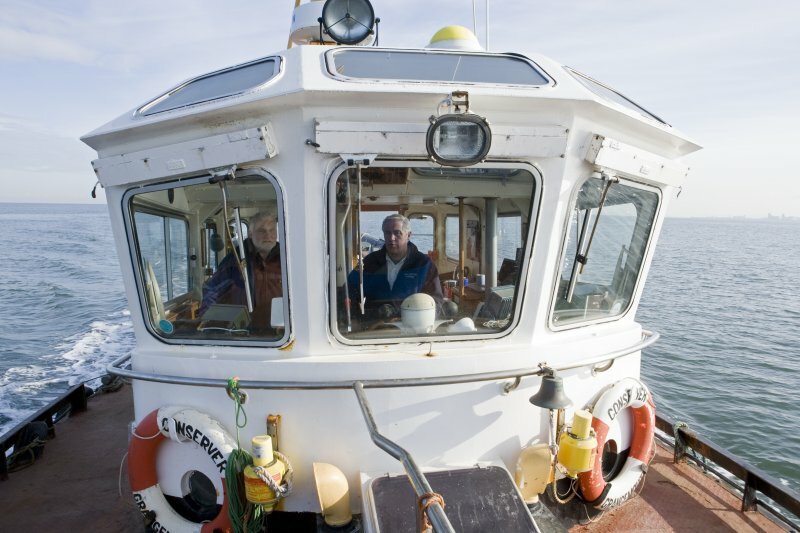 En route to the island, boat owner Bill Simpson and RCAHMS field surveyor David Easton. 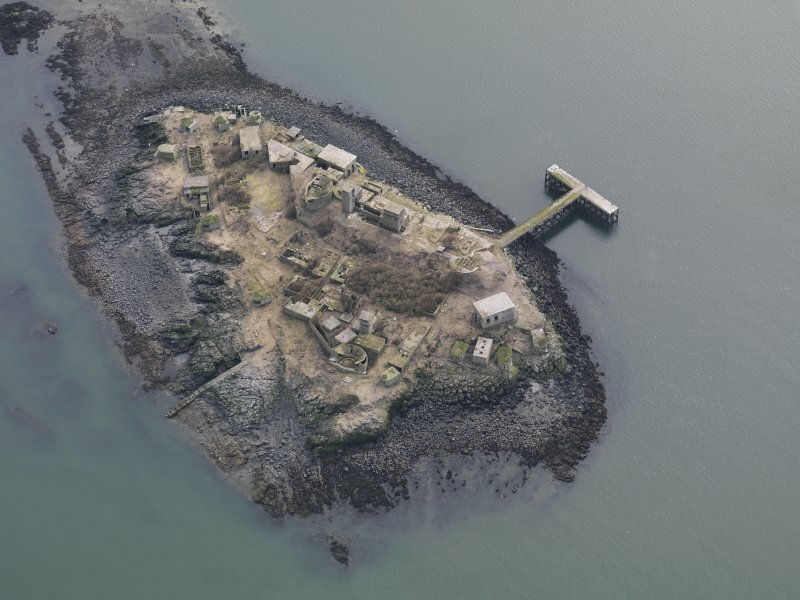 General oblique aerial view centred on the Island, taken from the SE. General oblique aerial view centred on the SE part of the Island, taken from the WSW. 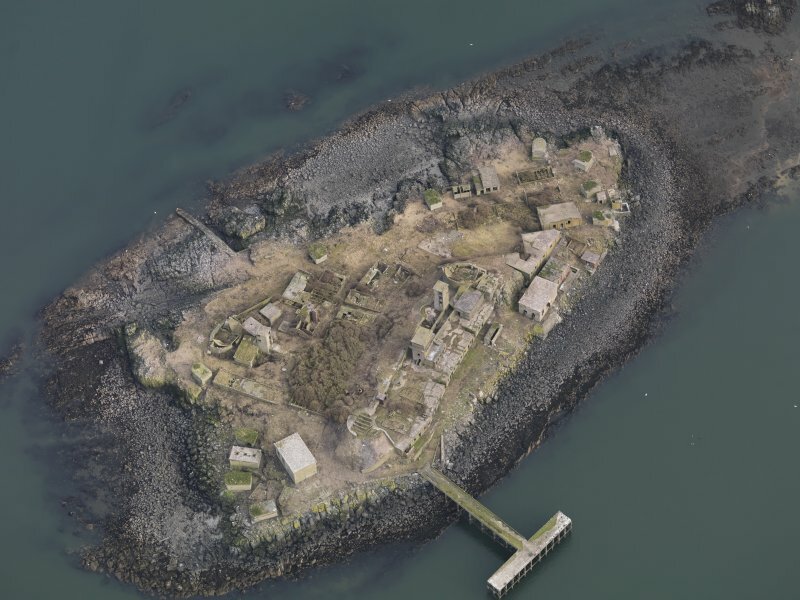 Oblique aerial view of Inchmickery centred on the 20th century military remains, taken from the S.
View from SSW showing stores building. View from WNW showing collapsed ablution hut. View from NW of pier and W side of island. 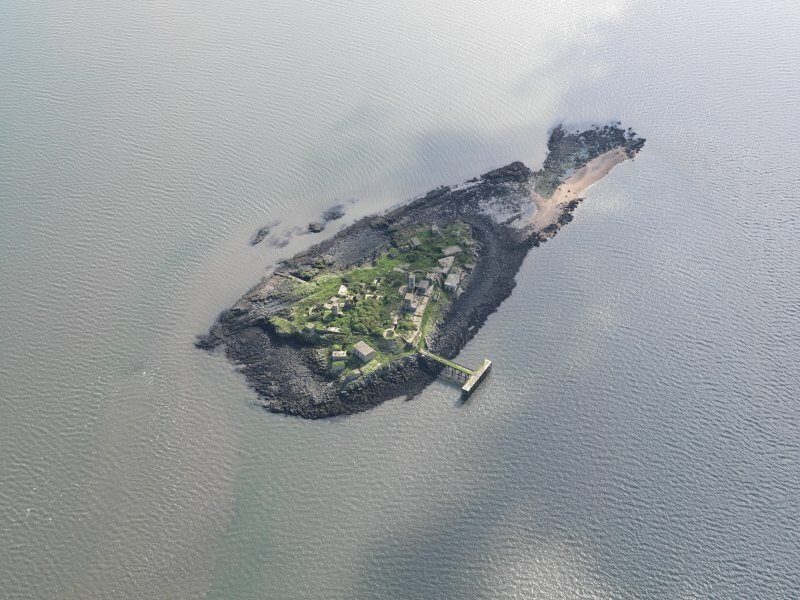 General oblique aerial view centred on the Island, taken from the SW.
General oblique aerial view of Inchmickery, taken from the SE. 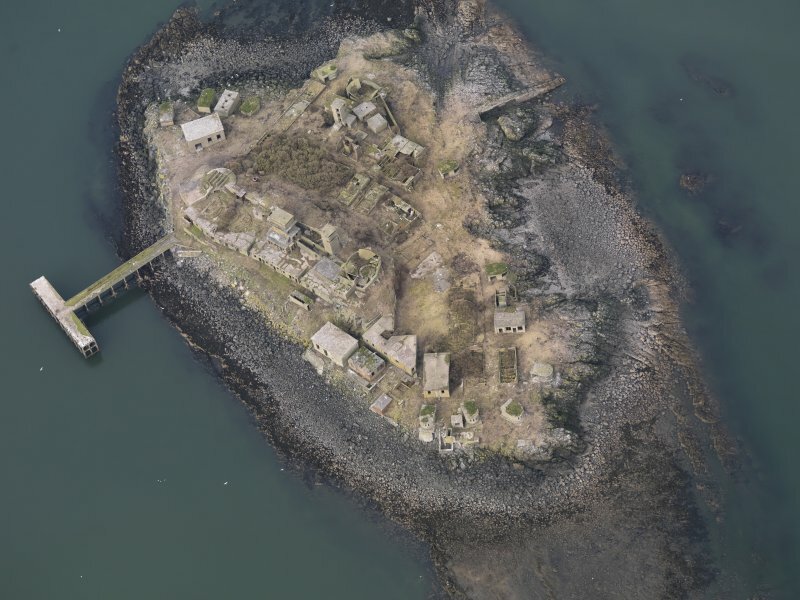 General oblique aerial view of Inchmickery, taken from the SSE. 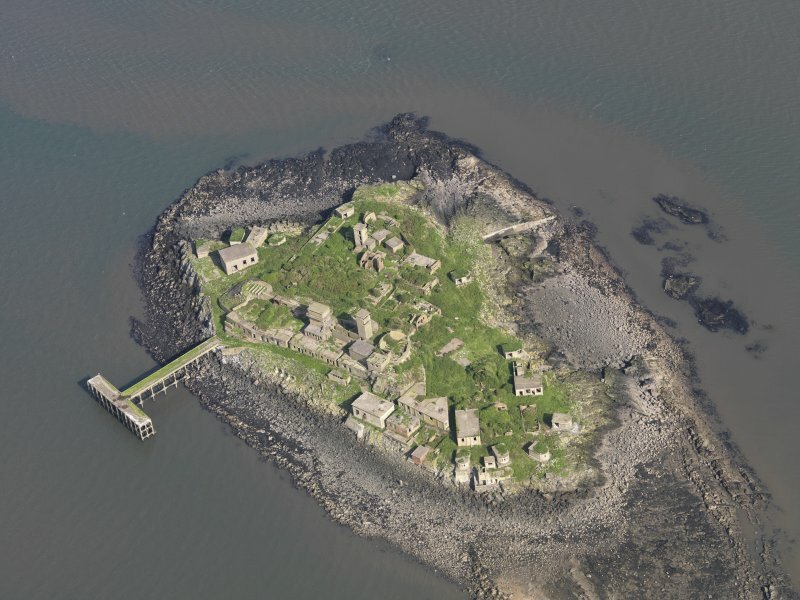 Oblique aerial view of Inchmickery, taken from the NE. 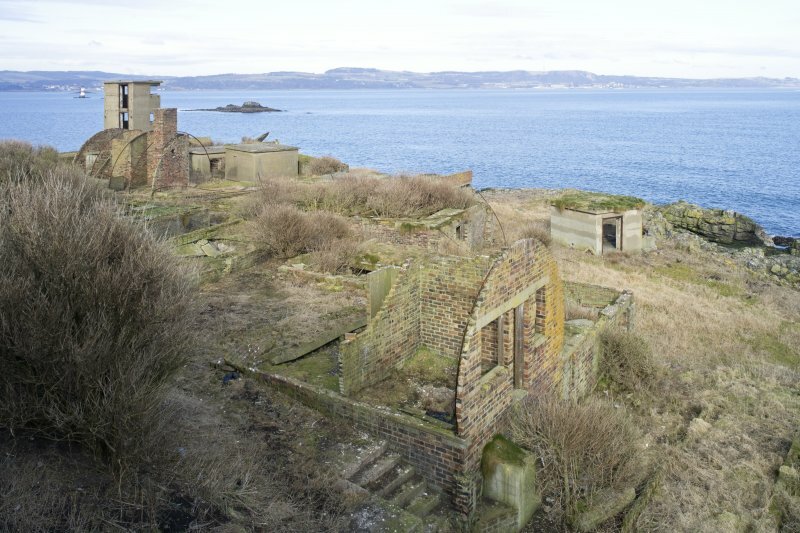 View from S shoing collapsed huts with No.2 gun emplacement and Battery Observation Tower. 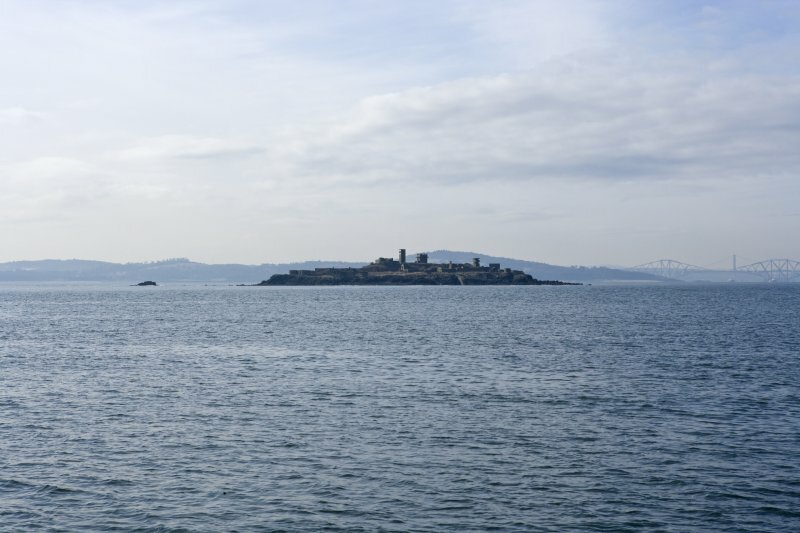 General view from N of island from approaching boat. 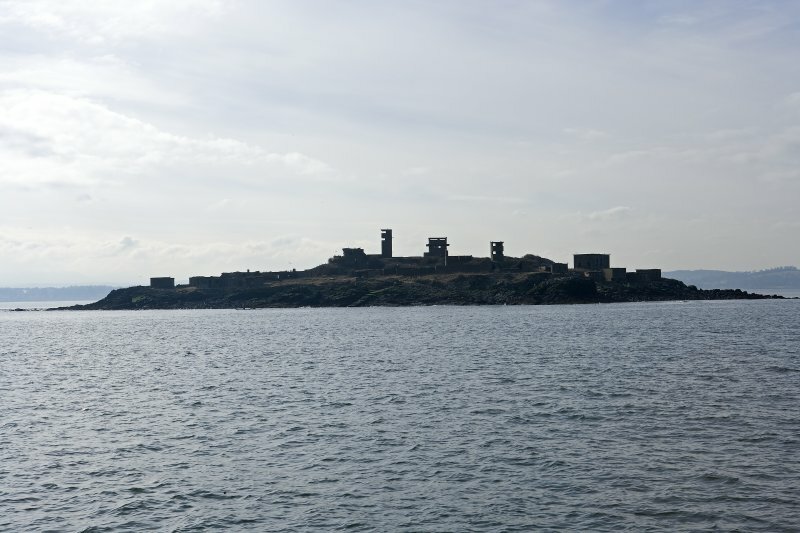 General view from NE of island from approaching boat. General oblique aerial view centred on the Island, taken from the E.
General oblique aerial view centred on the Island, taken from the NW. 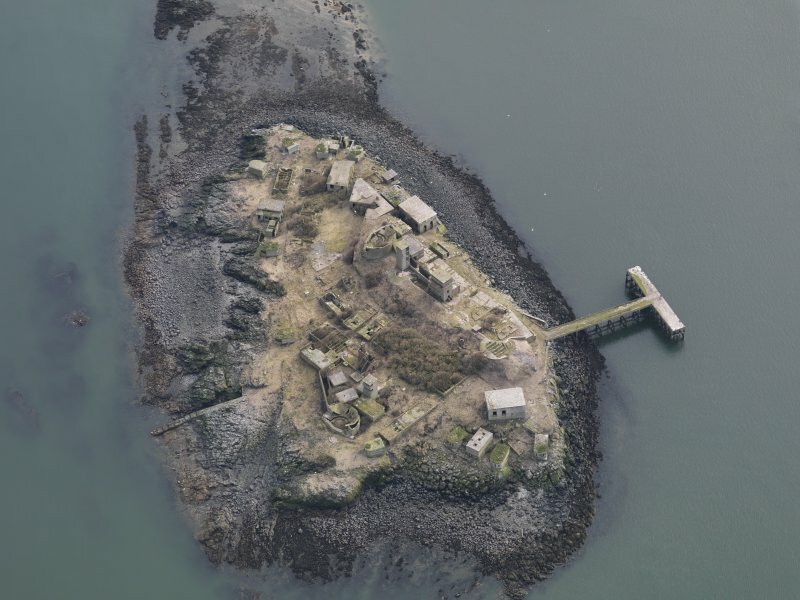 Oblique aerial view of Inchmickery, taken from the NNE. View from NW of row of buildings on W side of the island. 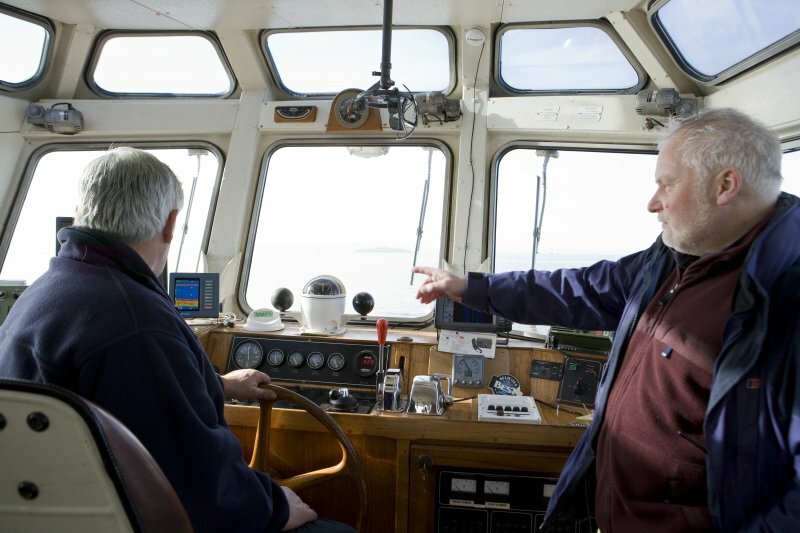 En route to the island, view of bridge with boat owner Bill Simpson and RCAHMS field surveyor David Easton. 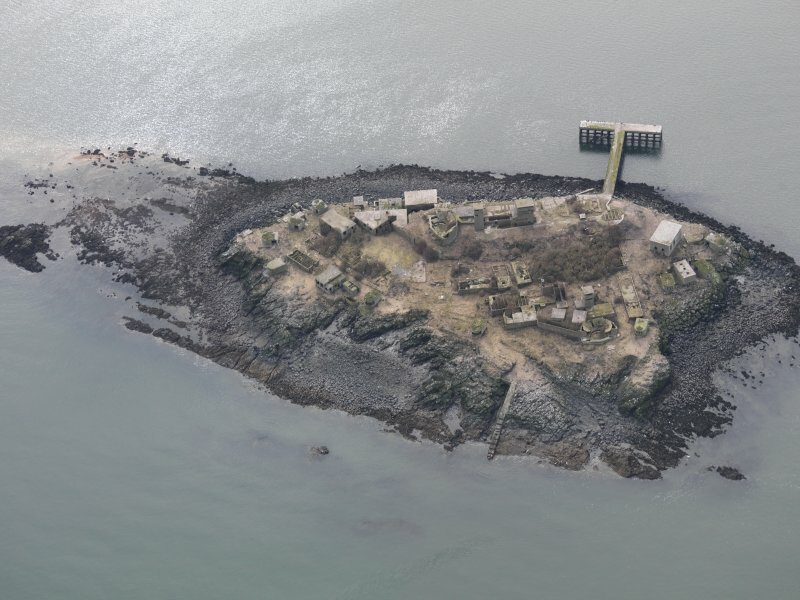 Oblique aerial view of Inchmickery, taken from the SW.
Oblique aerial view of Inchmickery, taken from the E.
View from SSE looking back to No.1 Gun Emplacement and Battery Observation Tower with stores buildings in the foreground. View from WNW of pier and W side of island. General oblique aerial view centred on the N part of the Island, taken from the NW. Distant general view from E of the island. 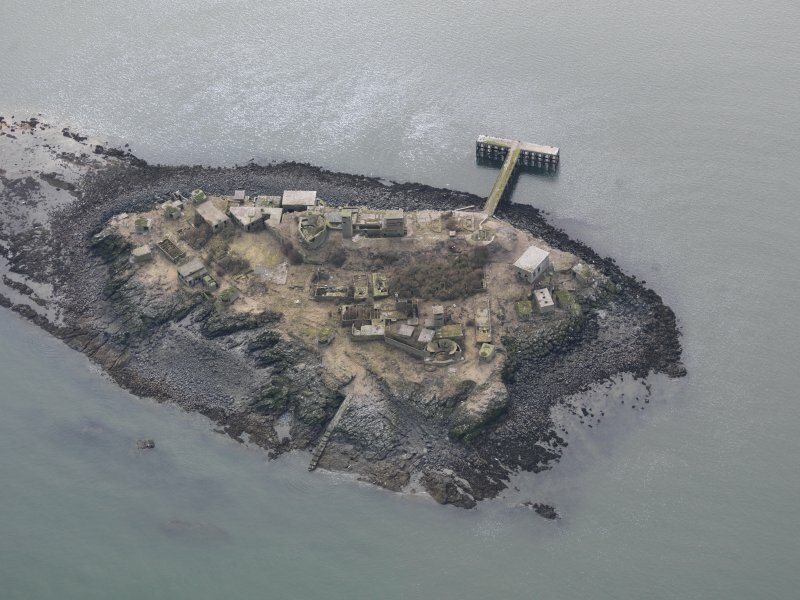 General oblique aerial view centred on the Island, taken from the NNE. 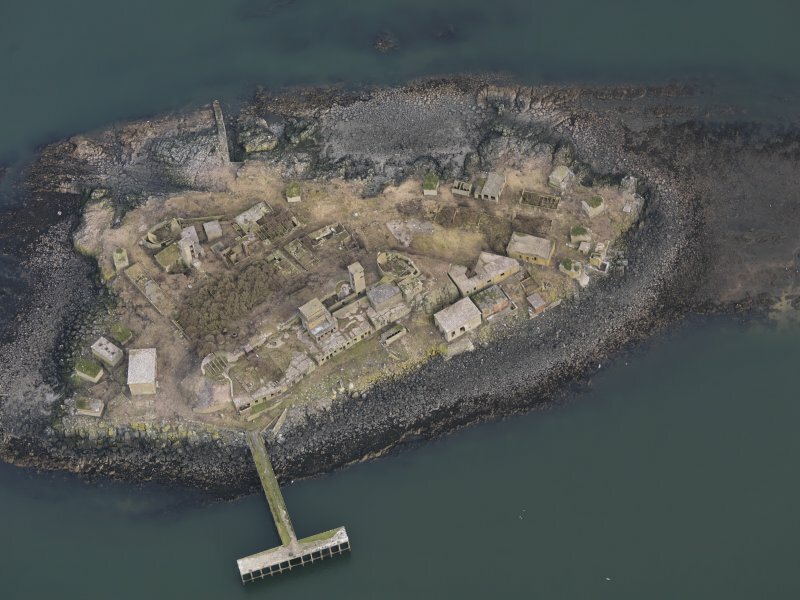 Oblique aerial view of Inchmickery, taken from the S.
Oblique aerial view of Inchmickery, taken from the NW. 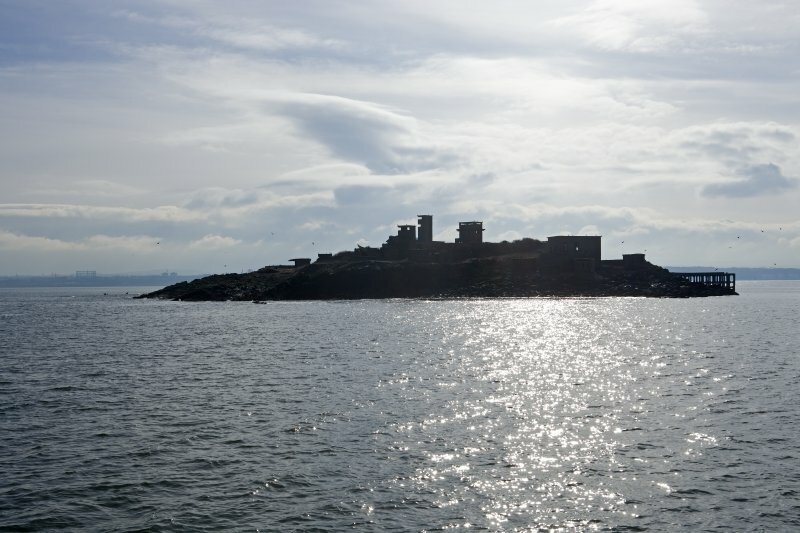 General view from E of island from approaching boat. 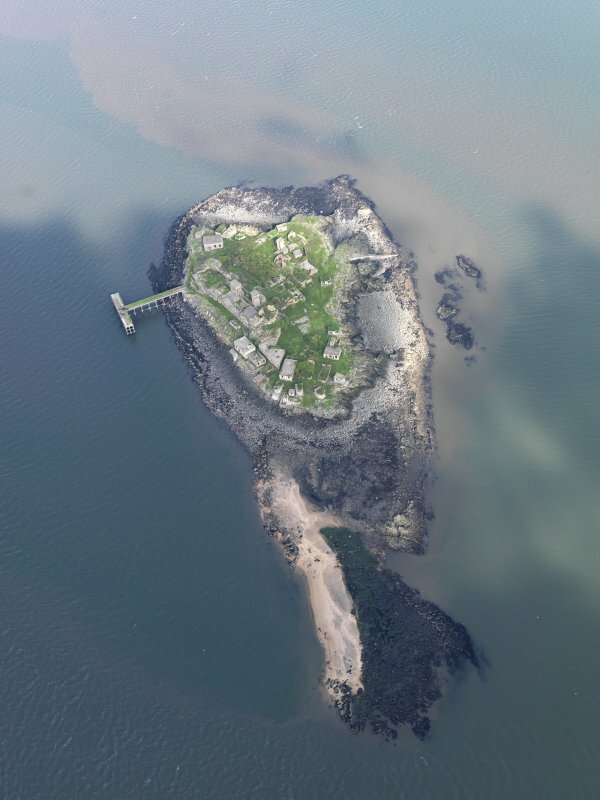 General oblique aerial view centred on the Island, taken from the S.
General oblique aerial view centred on the Island, taken from the SSW. General oblique aerial view of Inchmickery, taken from the W.
General oblique aerial view of Inchmickery, taken from the NW. 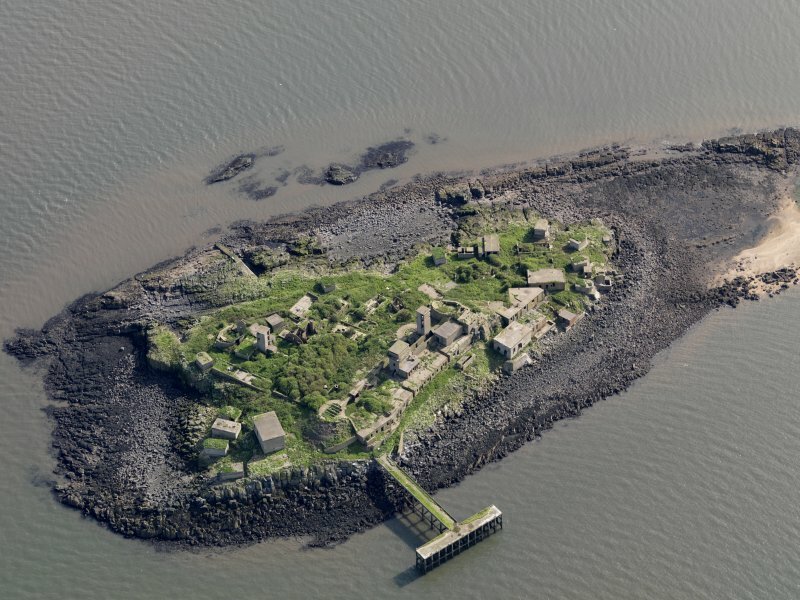 The island of Inchmickery was fortified in 1915 as part of the Middle line of defence of the Forth, and specifically to cover the anti-submarine boom that ran from Burntisland Sands to Cramond Island. 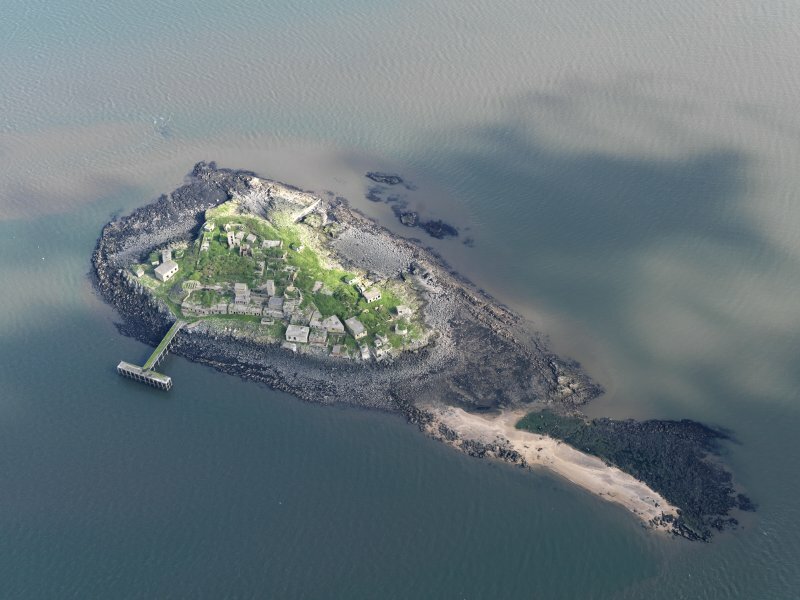 The guns of Inchcolm and Inchmickery were first manned on 16 March 1915, when a detachment of 72 NCOs and men landed on the two islands from Leith Royal Garrison Artillery. 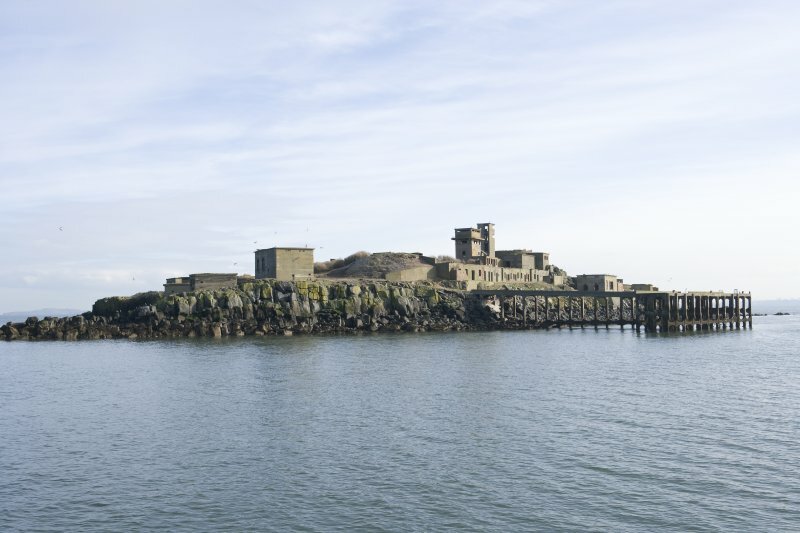 Inchmickery was originally intended to have four 12-pdr guns and two searchlights. A plan of 1916 exists (The National Archives WO 78/5163) for four searchlights, but it is not known if these were built. 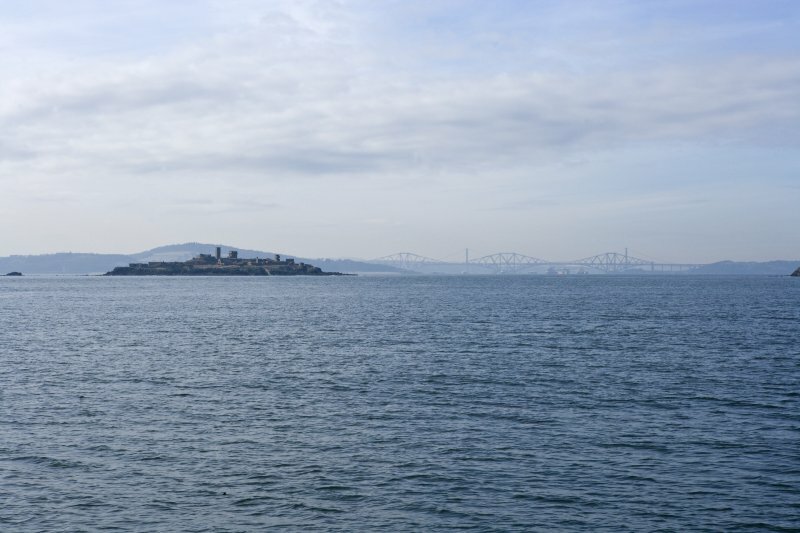 When the defences of the Forth were restructured in 1916 the 12-pdrs on Inchmickery were replaced by four 4-inch Mk III guns transferred from the island of Inchgarvie, below the Forth Rail Bridge. (The National Archives WO 192/108 [Inchcolm Fort Record Book]). They were ready for action between November 1916 and January 1917. 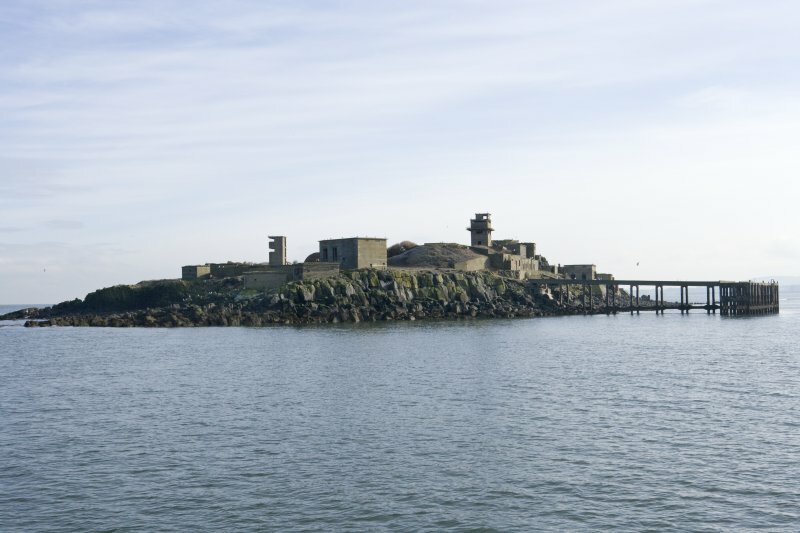 The emplacements for the four guns were not re-used in the Second World War. Two emplacements for twin 6-pdr guns were planned from at least 1938 (The National Archives WO 78/5163). 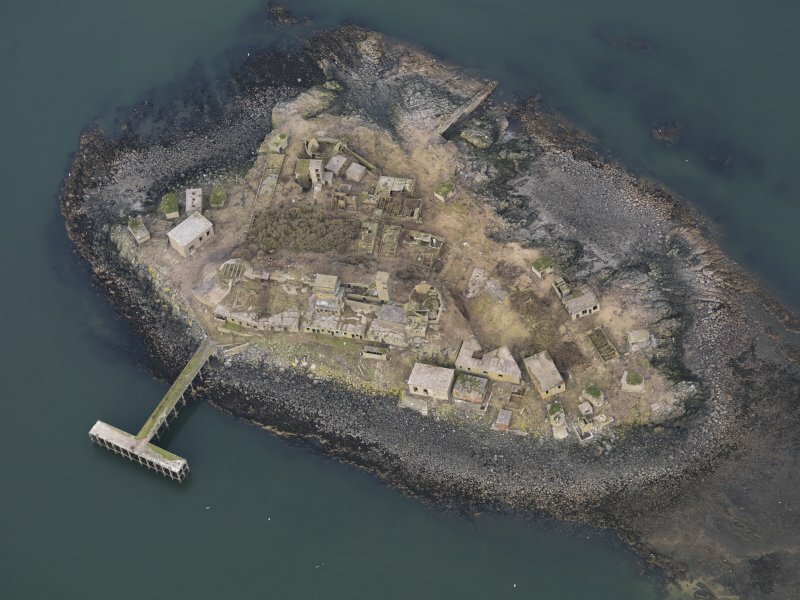 Information from HS/RCAHMS World War One Audit Project (GJB) 16 August 2013. N.B. 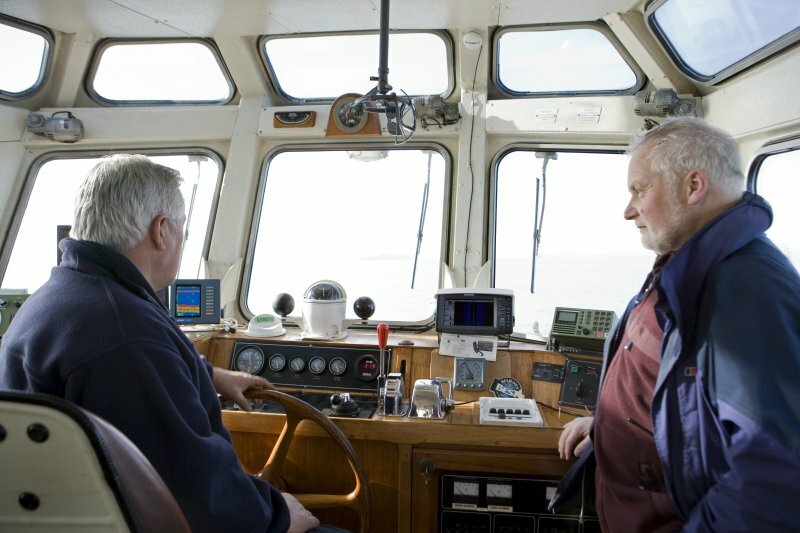 All grid references have been made against the current OS digital maps. 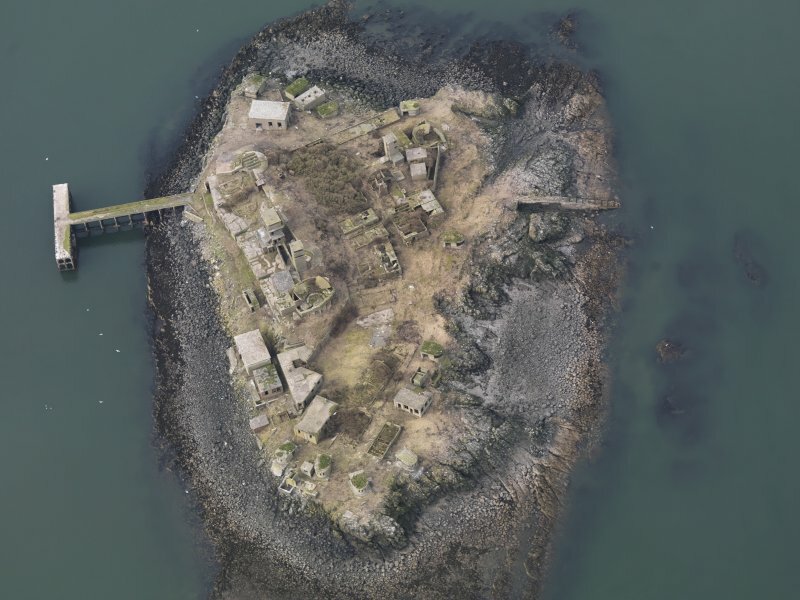 However, it has been noted that there is a difference between the ortho-rectified Ordnance Survey vertical air photographs of at least 30m. 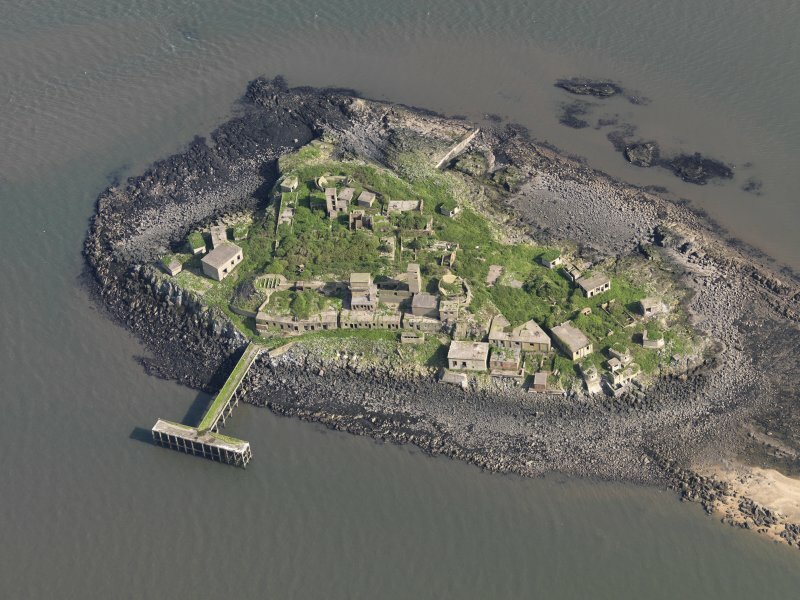 No GPS survey was carried out by RCAHMS on the island. 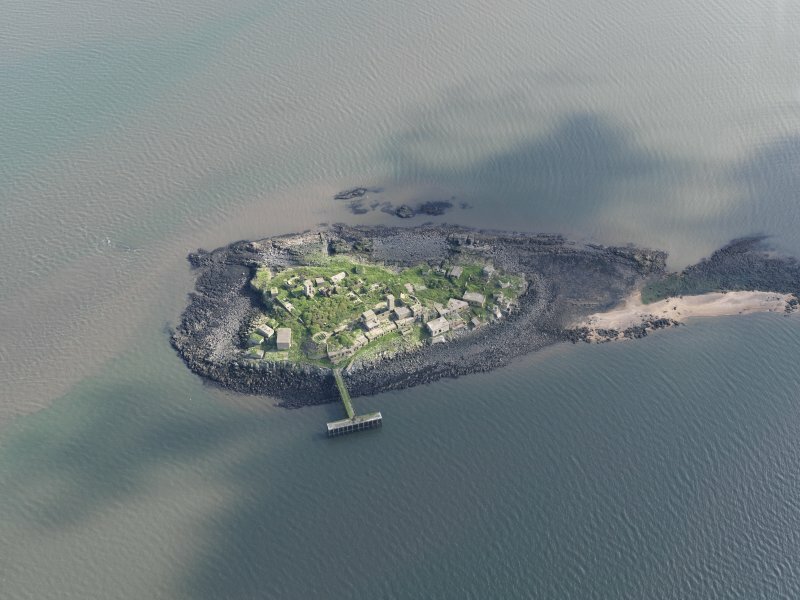 Inchmickery has been defended in both world wars. 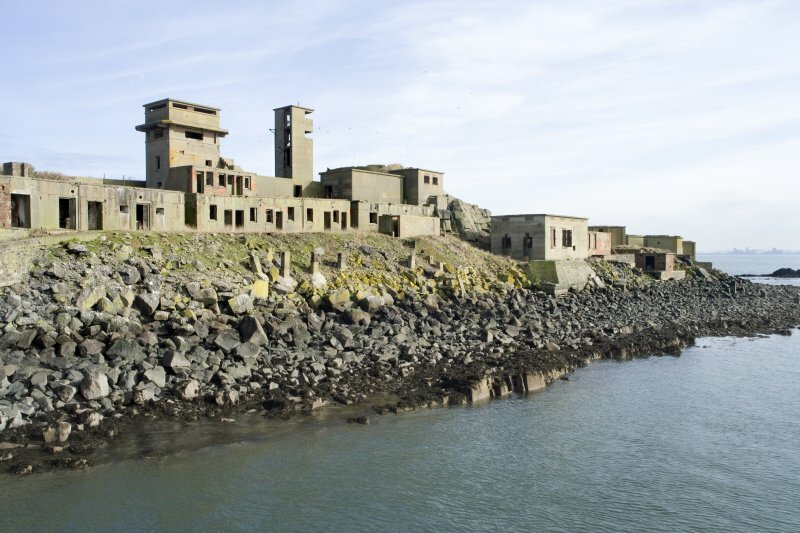 In World War I the island was manned and armed by 1915 and two coast batteries with associated searchlights were built. The calibre of the guns was altered during the war, and the guns were removed in 1917 and 1924 respectively. 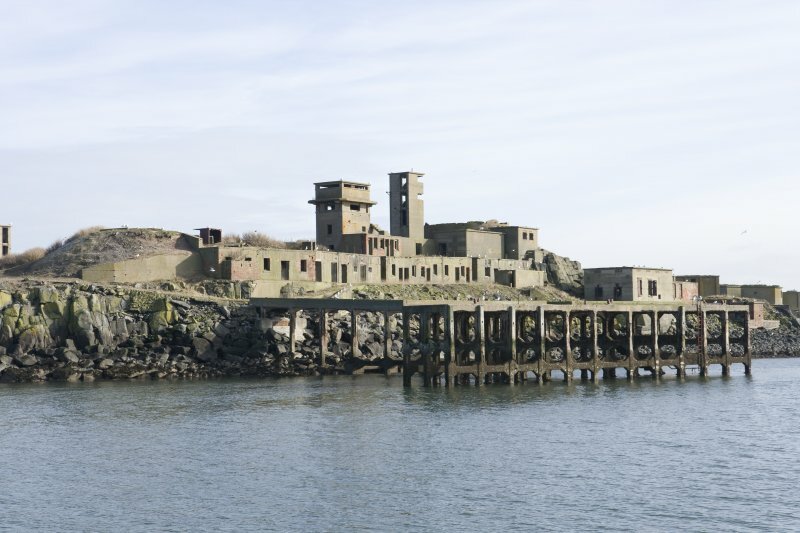 In September 1939, the island gun positions re-armed and 160 Heavy Battery RA (Forth Heavy Brigade) under the command of Major Anderson were mobilized to man the various coast positions throughout the Forth area. 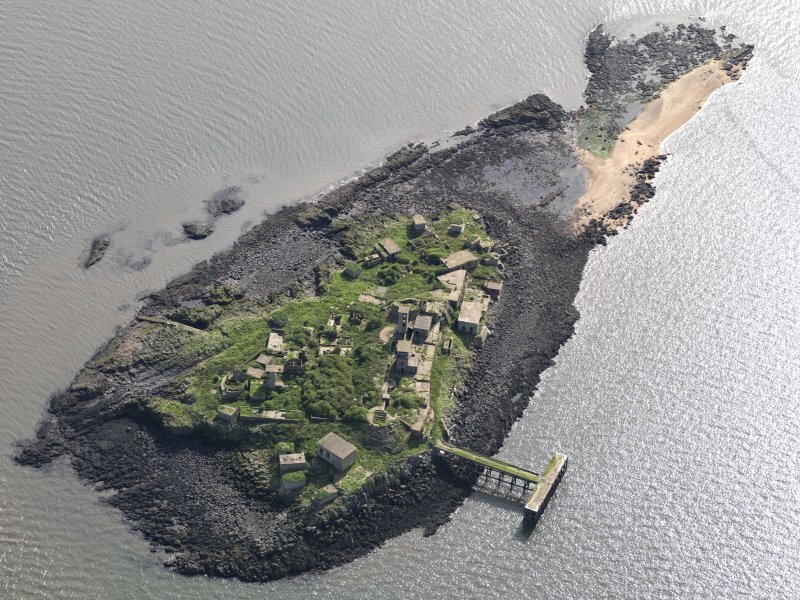 However, it was not until March 1940 that a detachment from Cramond proceeded to Inchmickery, which at this stage had no guns mounted. 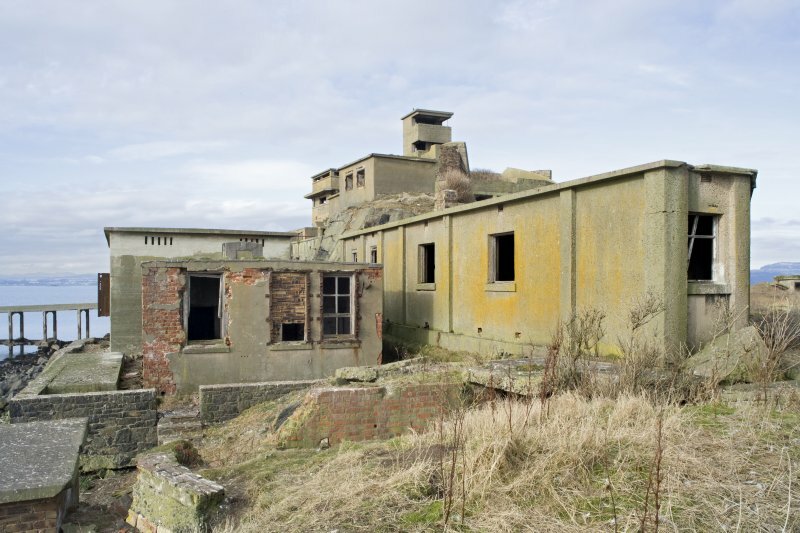 At this time a detachment of the Royal Engineers were installing engines, searchlights and laying surface cables, while civil contractors, John Best & Sons, Edinburgh were building the accommodation. 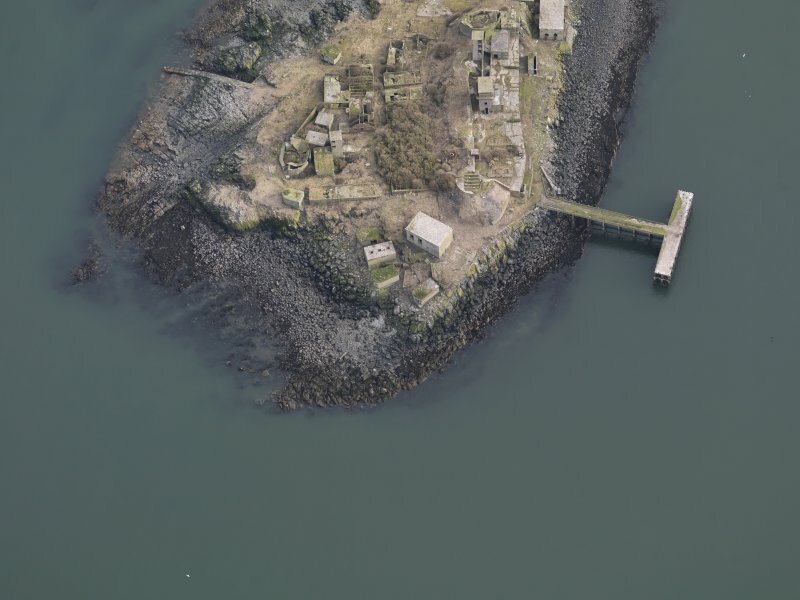 By July 1940, the concrete pier was complete, thus allowing boats to approach and land on the island in safety. 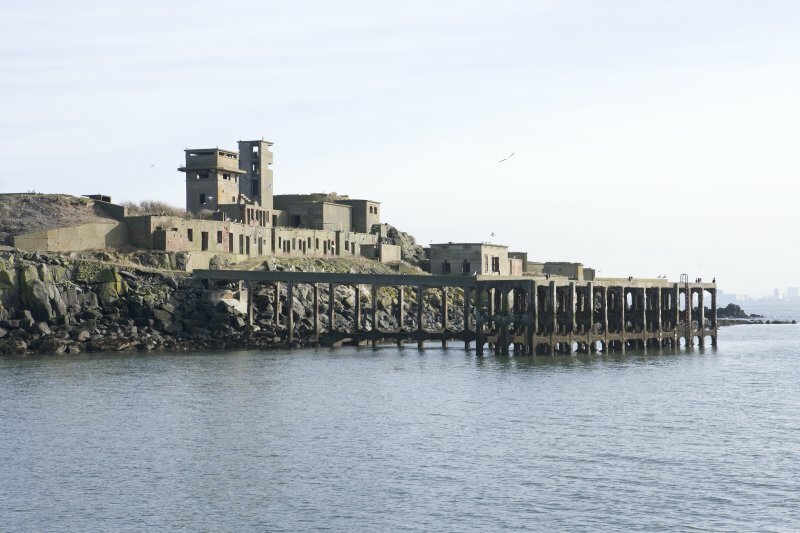 The guns were installed in early April, No.1 gun being taken to its emplacement via a sleepered track from the pier and No.2 was taken by the existing path past the N engine room. 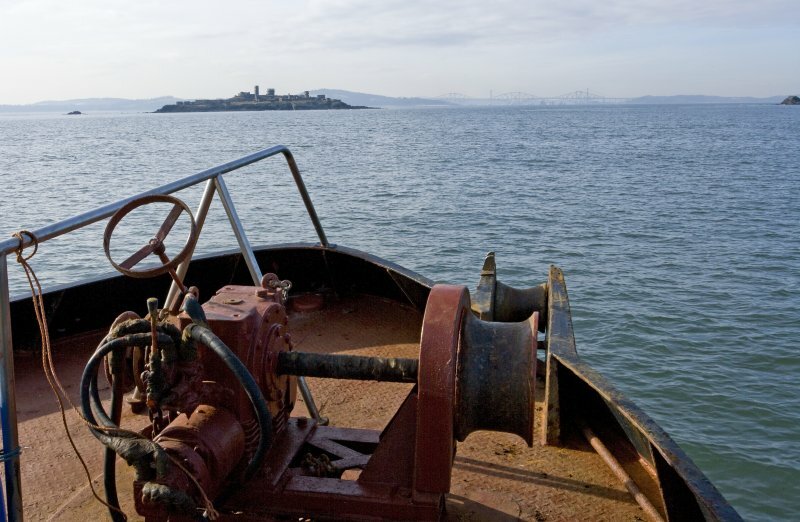 In May 1940 the guns were tested and by July a further two were installed with two more in February 1942. 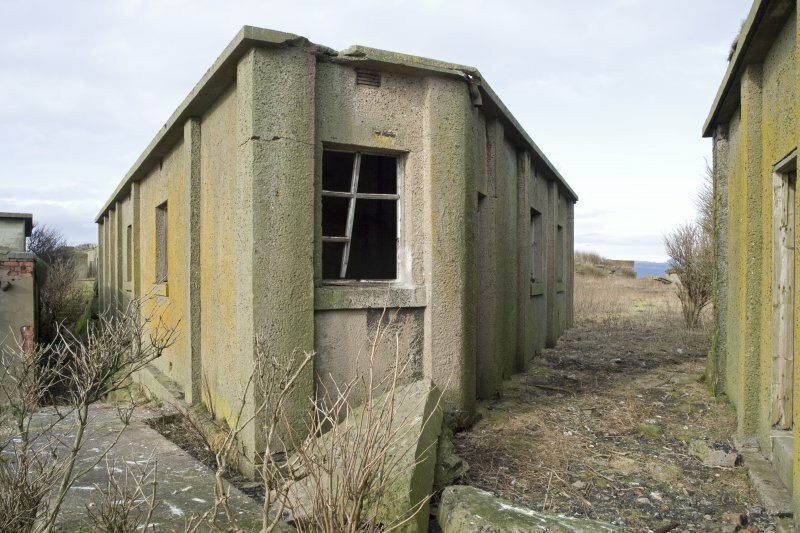 June 1941 saw the completion of the accommodation in the form of wooden huts, however, it was decided that these created too high a fire risk, and in July 1941 they were pulled down and the paths torn up, so that nissen huts could be substituted. 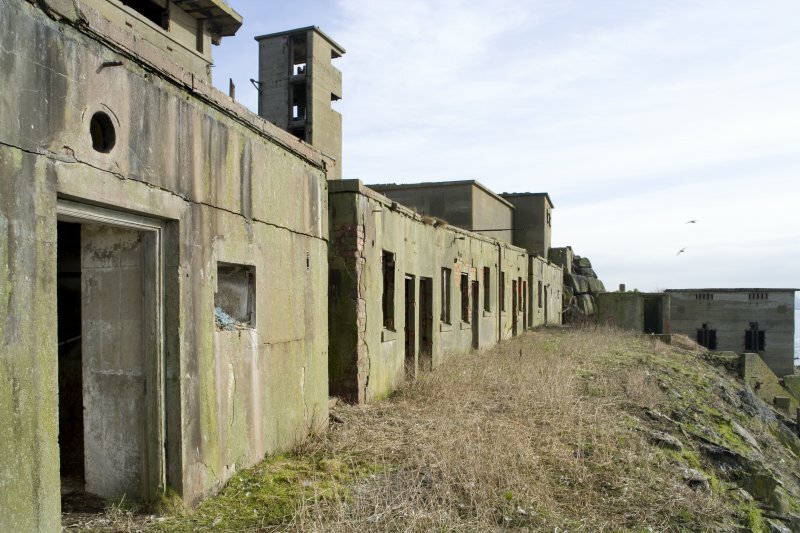 This work was carried out by 585 (Edinburgh), Field Park Company, Royal Engineers and was completed in May 1942. 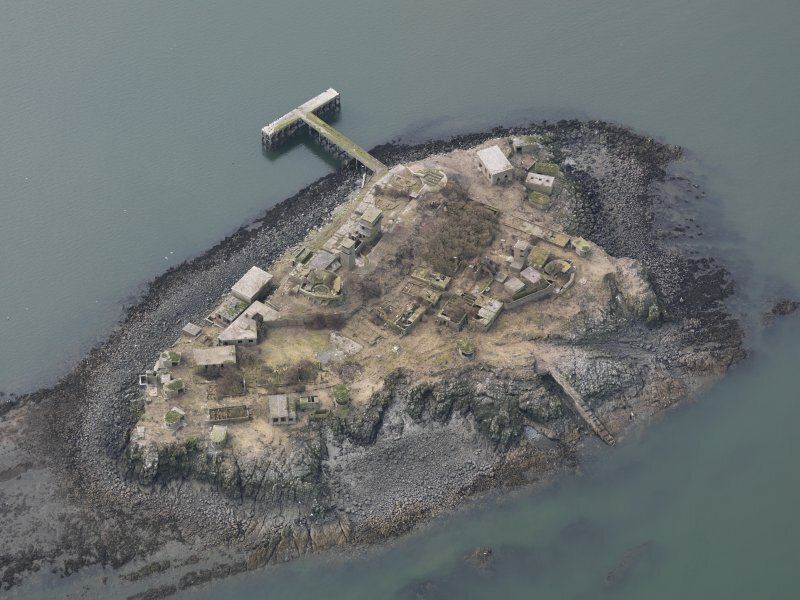 This alteration reduced the accommodation, consequently forcing one third of personnel to spend two weeks on the island and one week on Charles Hill Battery (NT18SE 27). 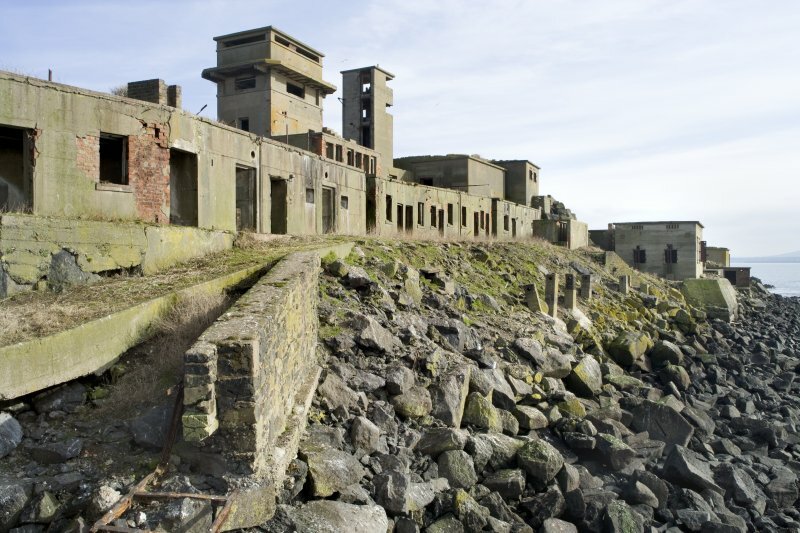 In August 1942 most of the personnel on the island were moved away and some work carried out to restore the island to its previous state. 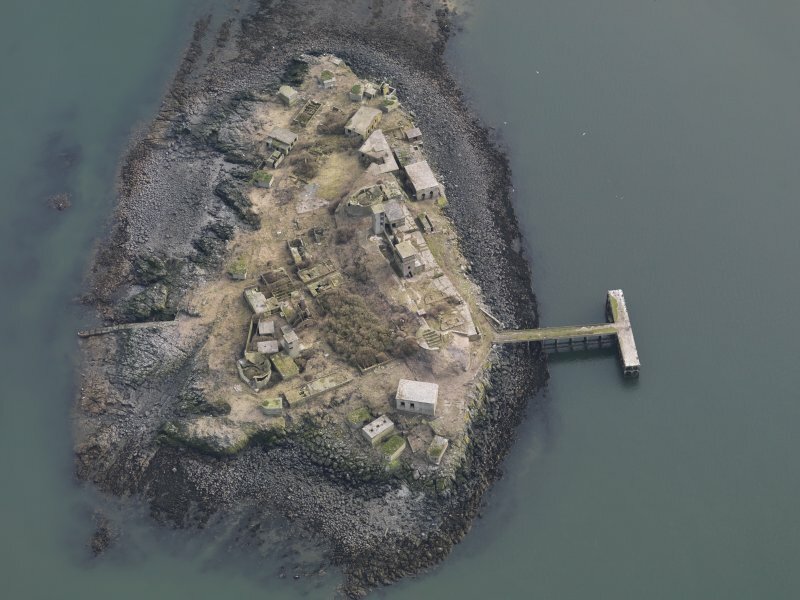 A short visit was made to the island in late February 2010 by RCAHMS to undertake a rapid photographic survey. 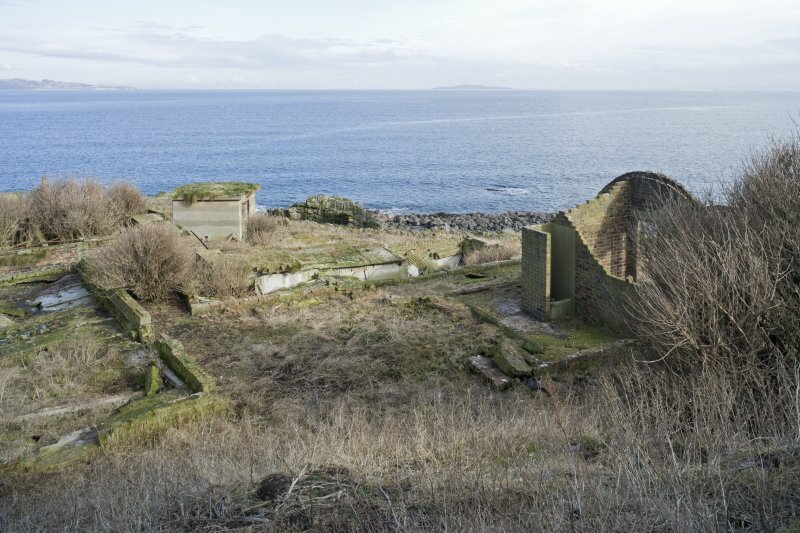 The visit allowed the RCAHMS field surveyor to check grid references and ascertain what survives of the military presence on the island. 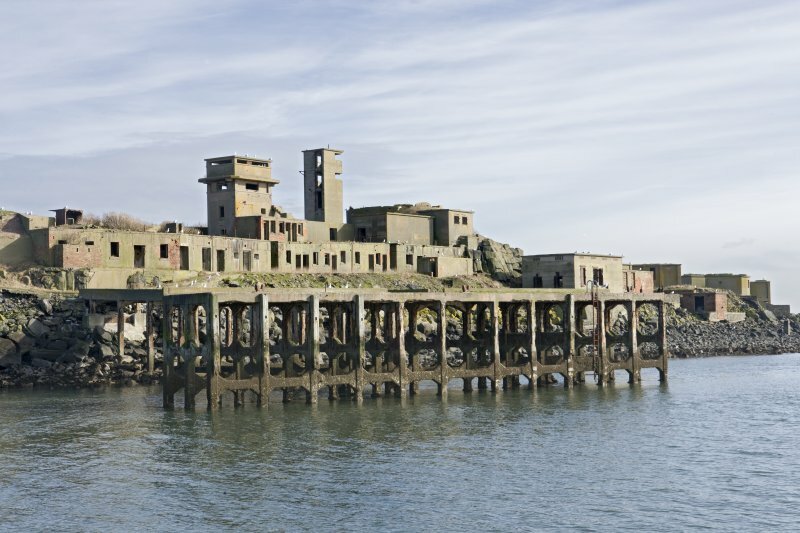 First and Seond World War remains survive on the island, the main discovery being the early and later gun emplacements along with the respective tall Battery Observation Posts. The visit also allowed additional sub-numbering to the existing record to include searchlight batteries, engine rooms, pier and jetty. 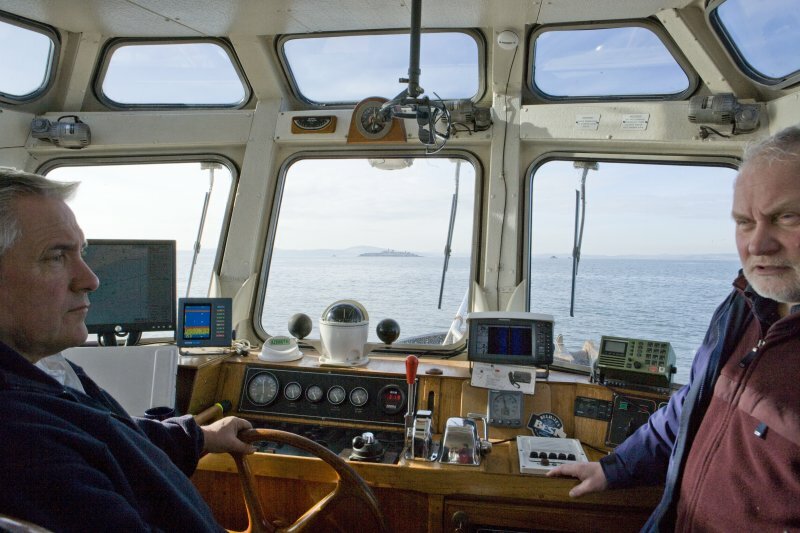 The estuary of the River Forth has been a vital and strategic area of defence for centuries. 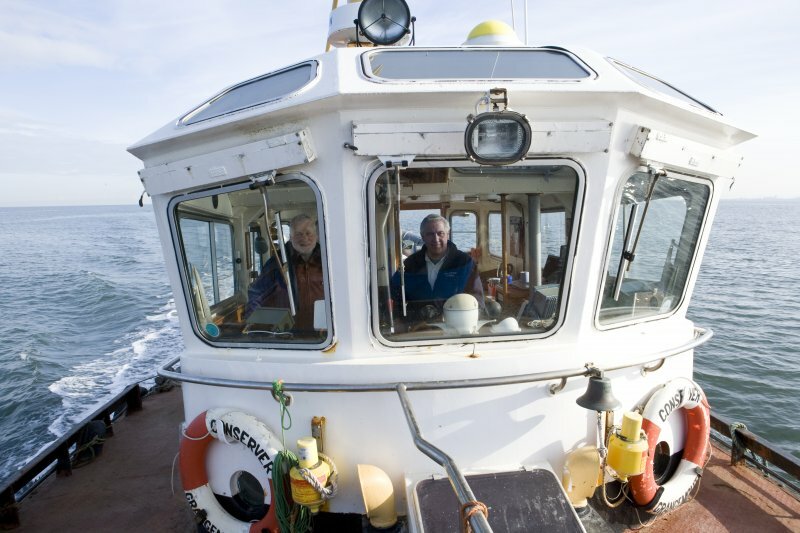 The estuary, because it faces Europe, cuts deep into the country and has the nation’s capital on the southern shore, was, for a long period, perceived as a vulnerable point on the coast of Britain. 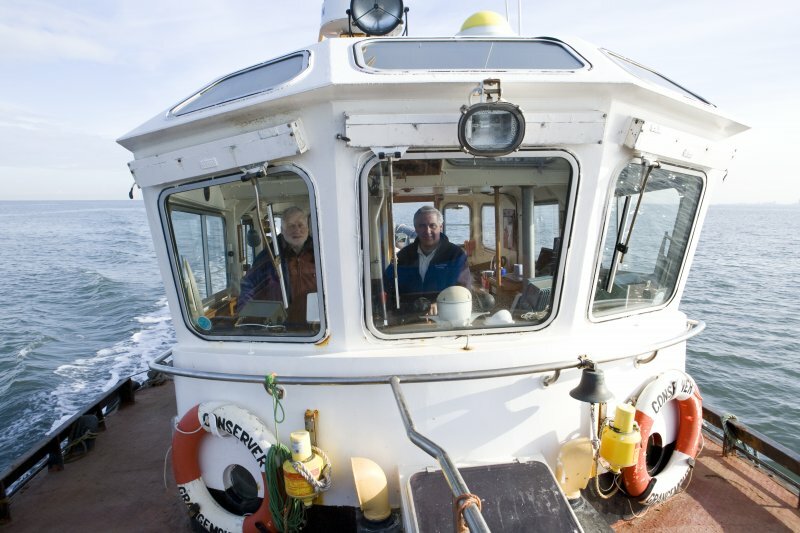 It is also the only sheltered anchorage between Invergordon in Easter Ross and the Humber. 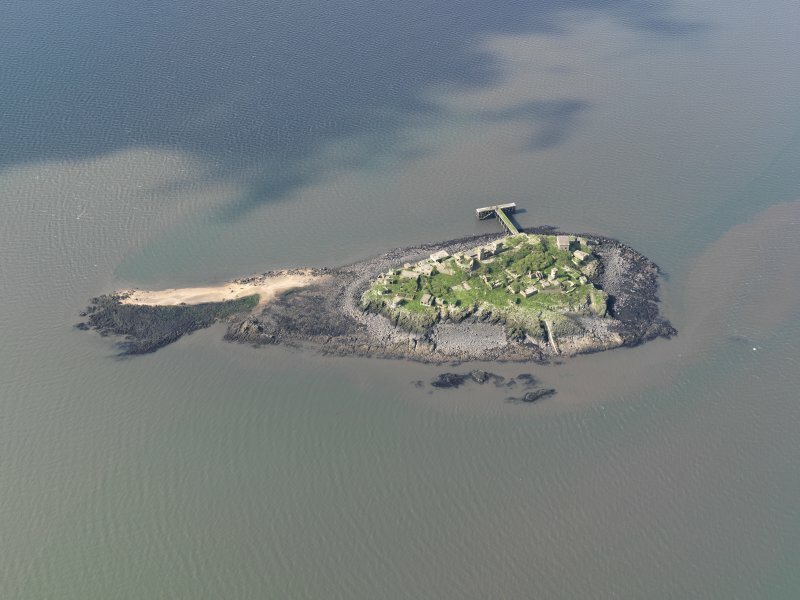 From the time of Mary Queen of Scots to the mid-1950s the islands of Inchgarvie, Inchcolm, Inchmickery, Inchkeith and the Isle of May have all, at one time or another, had defences built on them. 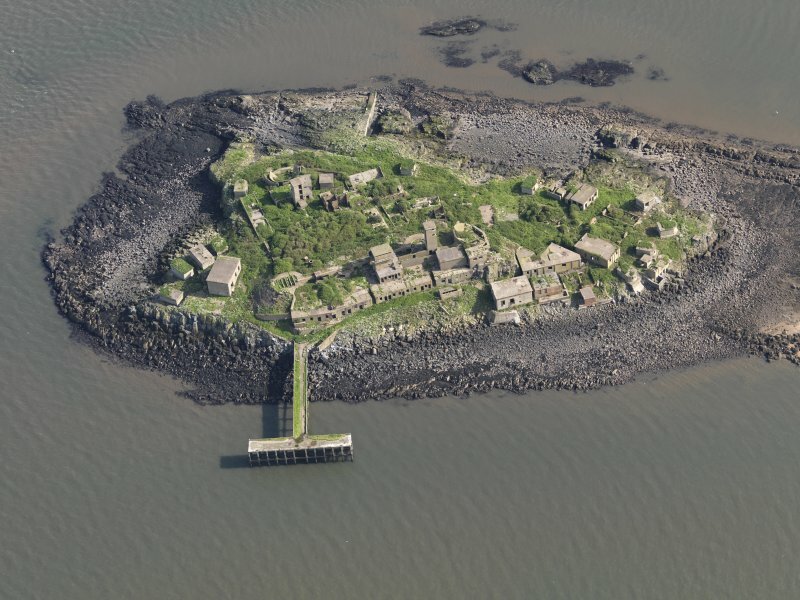 As part of the recording of twentieth century defences in Scotland, two of these islands, Inchkeith and Inchmickery, were selected for survey work. 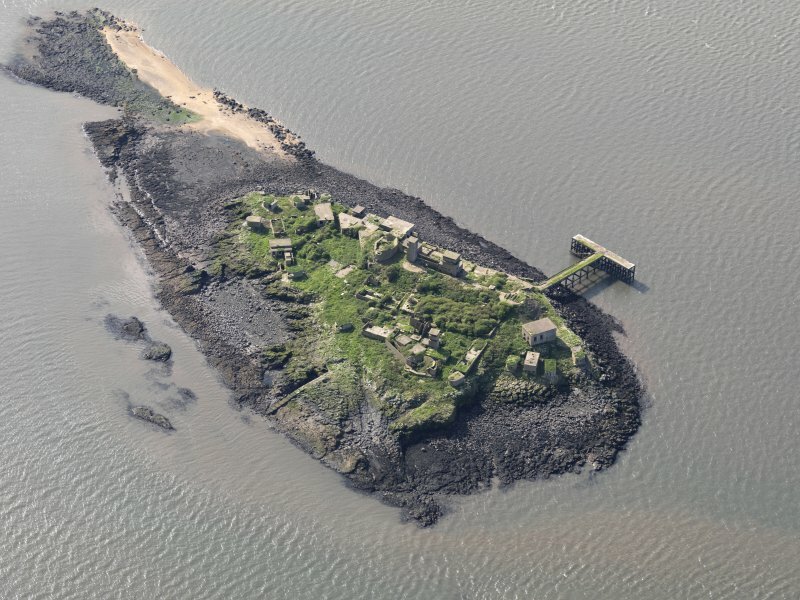 Inchmickery, situated about 3 km N of Silverknowes, has an area of approximately 1.3 hectares. 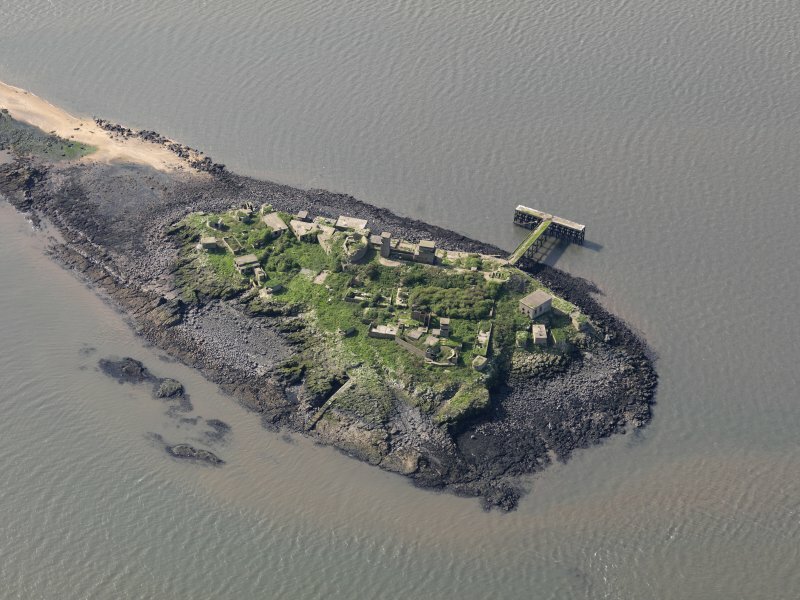 The defences on the island all date from the twentieth century and include those from World Wars I and II. 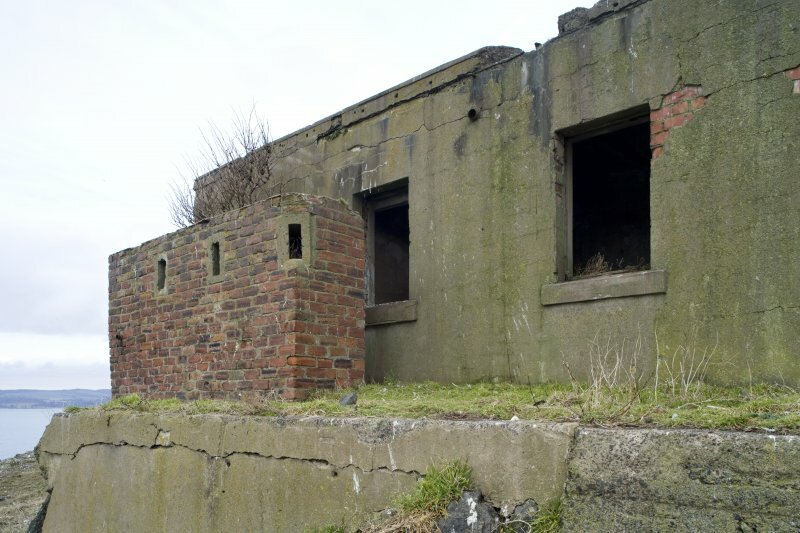 The First World War defences are still visible and consist of emplacements for 12 pounder and 4-inch guns. In the Second World War the guns had been replaced by twin 6 pounder quick firing anti-shipping guns. These were placed on a care and maintenance basis as early as 1943. 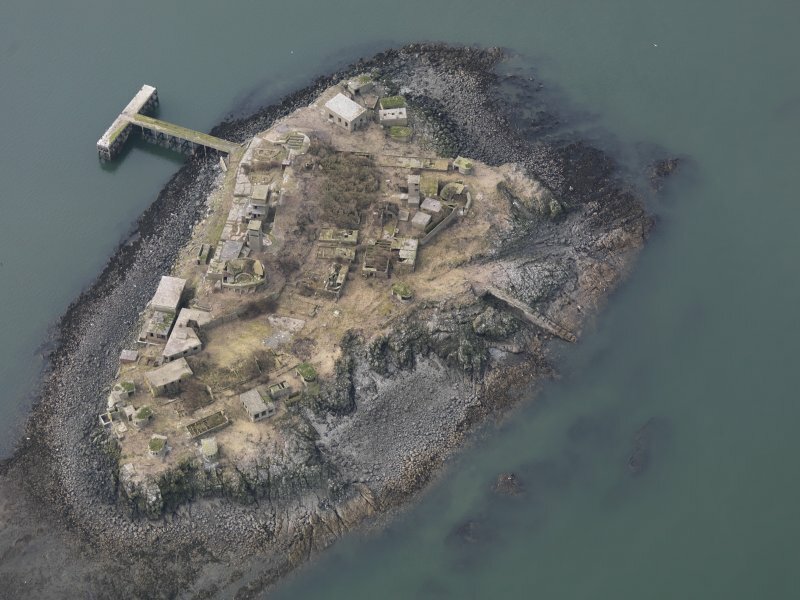 Virtually all space on the island is taken up with the remains of wartime structures. 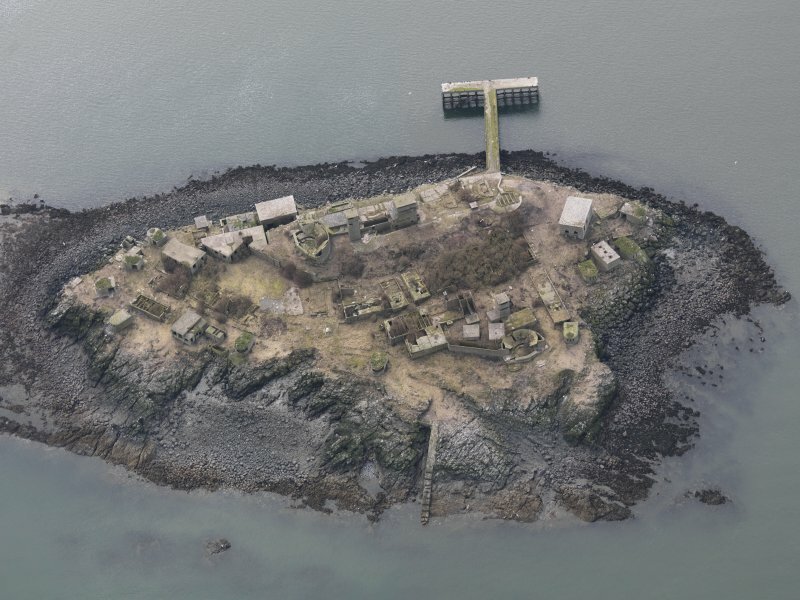 The key features are three tall Battery Observation Posts and two individual gun emplacements, along with a gun platform with three gun holdfasts. 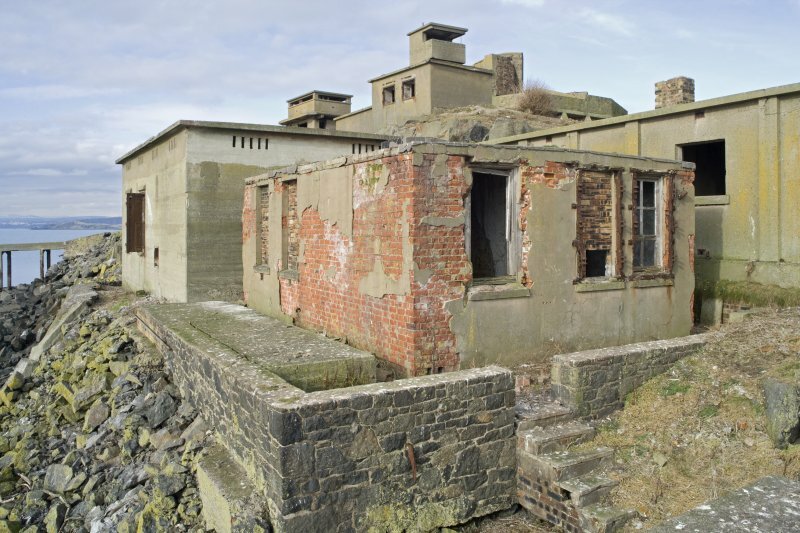 The rest of the space is occupied by huts, engine houses, offices, searchlight positions and stores. 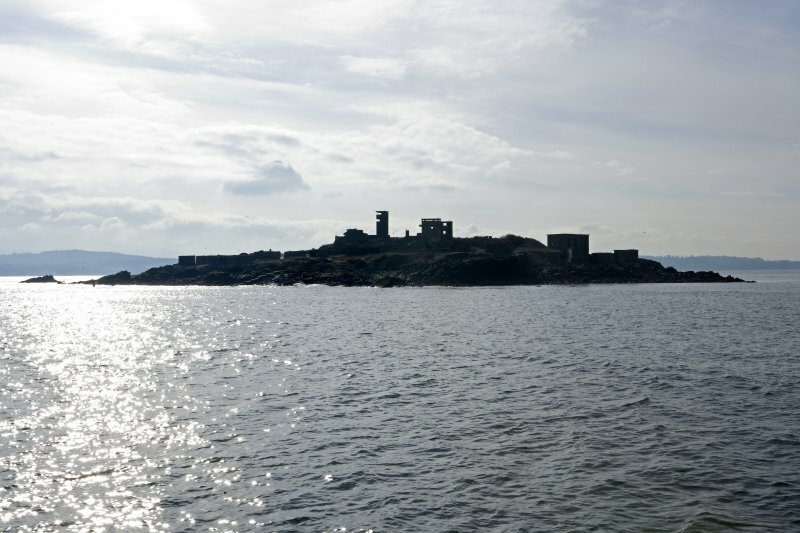 It has often been thought that the structures on the island were built to mimic a battleship in silhouette; no hard evidence for this has been found and the author feels, following the visit by RCAHMS that this theory is highly unlikely. 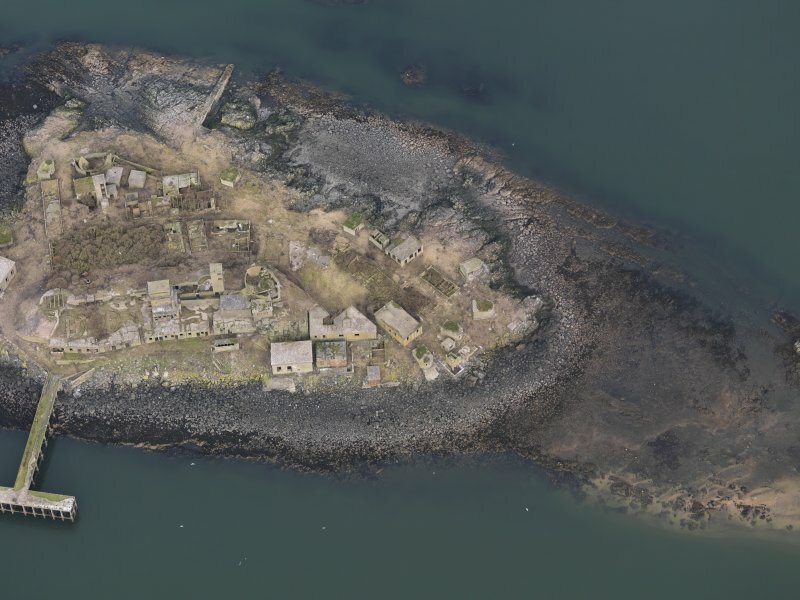 RCAHMS undertook a very rapid three hour photographic survey of this small island at the time of the Inchkeith project. The results are now in the Canmore database.